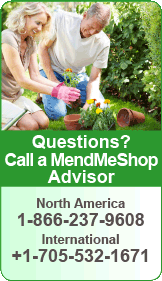 The most important factor in healing bursitis is resting your ankle. This can be difficult when you have to carry on with daily activities, but resting and elevating your foot whenever you can is recommended. During your recovery you will probably have to modify or avoid the activities that stress your bursa until your pain and inflammation settle. Treatments should involve decreasing swelling, relieving pain and stress on the ankle, correcting any biomechanical dysfunction (over-pronation or flat feet) and then restoring strength and movement in your ankle. If you are performing an activity that could cause further trauma to the bursa, it is recommended that you protect the area with padding and/or proper footwear to prevent further irritation or damage. For years, doctors, trainers, and other medical professionals have recommended RICE (Rest, Ice, Compression, Elevation) to treat the pain and swelling of fresh injuries, chronic pain, and after any re-injury. Cold Compression works by stopping and slowing nerve and cell function in the injured area and reducing swelling that can block blood vessels. This is important because once blood vessels are blocked or damaged, they can no longer carry oxygenated blood through the tissue and tissue cells begin to break-down. Without cold compression therapy cellular break-down and tissue damage continues as the cells do not get the oxygen they need to survive. 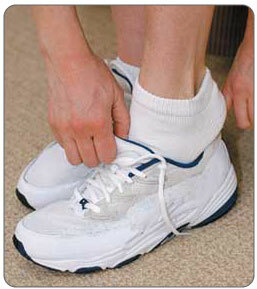 By limiting the amount of damage done to your Achilles Tendon, you also limit the amount of healing that needs to occur. 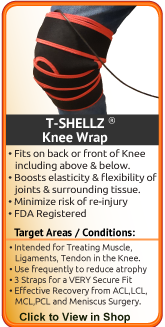 After applying cold compression to reduce initial swelling, begin using Deep Tissue Regeneration Therapy (via the Achilles T•Shellz Wrap® to continue the healing process. 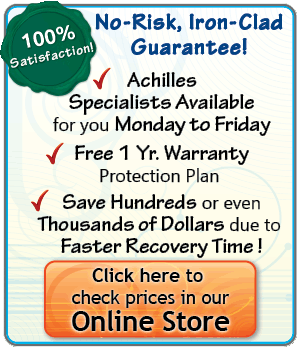 Once the inflammation of your bursitis has been reduced with an ice pack or cold compress, it is time to help the body boost its healing process through use of the Achilles TShellz Wrap. 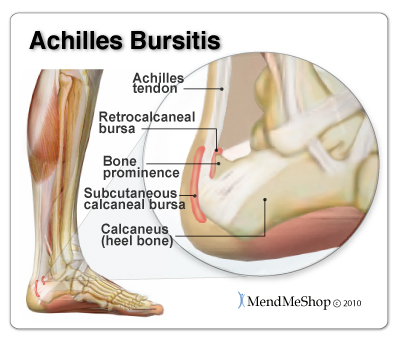 Unfortunately, when you are suffering from bursitis in your retrocalcaneal bursa and/or subcutaneous calcaneal bursa it is painful to walk and move your foot normally. When you limit movement in your foot the blood flow is reduced, starving your tissue of the necessary oxygen and nutrients. 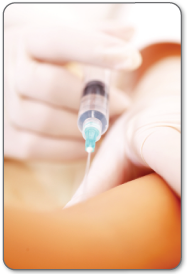 The trick is to find a way to increase blood flow without causing pain and/or further inflaming the bursae. This is where Deep Tissue Regeneration Therapy (Blood Circulation Boost Therapy) becomes a powerful tool. Helping to improve the elasticity of the achilles tendon as well as surrounding soft tissue. Further to this, your injury area will receive a magnified increase in blood flow which will flush toxins that always build up around a soft tissue injury and introduce more nutrients (its in the blood!) to damaged cells so they can heal at a highly accelerated rate. 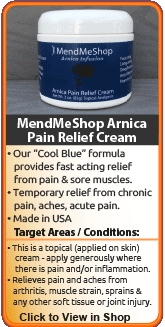 We guarantee that this will get your bursae and/or Achilles tendon back to normal fast. Blood Circulation Boost Therapy compliments your body's natural healing process by promoting the flow of blood to your foot while you give it the rest it needs. 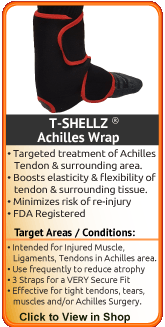 Each Achilles TShellz Wrap contains an Energy Pad that is flexible and shaped to conform around the back of your ankle. This Energy Pad provides a uniform wave of healing electromagnetic energy over the entire treatment area. This energy travels deep inside your Achilles bursa to stimulate the blood flow that is needed to heal your injury. 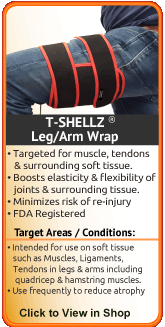 It is the electromagnetic energy provided by our Achilles TShellz Wrap that is crucial to the healing process. 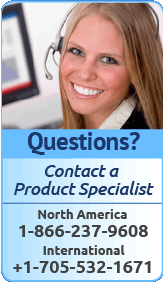 Electromagnetic energy waves are not heat waves. 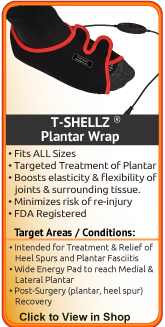 When they are emitted from the TShellz Wrap they penetrate right through your skin and fat layers until they get to your Achilles tendon. Once they reach the injured area, they are absorbed and quickly converted into heat energy right at the location of your injury. 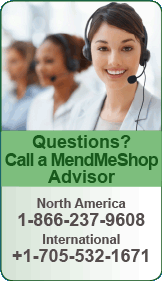 Giving your body the boost it needs to continue the reconditioning process. The healing energy reaches deep into your subcutaneous calcaneal bursa, retrocalcaneal bursa and Achilles tendon to speed tissue repair, whisk away the toxins and dead cells, and rejuvenate your ankle tissues for improved elasticity. This 2 step process is the most effective way to treat Achilles bursitis and improve the health of the soft tissue in your ankle.